Are you skeptical about the pros and cons of buying a DIY home security system? When you’re finished reading this article, there’s no doubt, you’ll know one hundred percent sure whether it’s right for you or not. They’re are so many advantages of using a DIY home security system (rather then using a big well known professional security system installer to come install and charge you fee after fee) just to have the same piece of mind you’ll have doing it yourself. Most DIY home Security systems offer easy step-by-step instructions by video (this makes it incredibly easy to install and have piece of mind). Which would also lessen the cost of having it installed by someone else. Most also offer a vast variety of assorted package deals to offer all of your valued needs that need to be met. All from cameras to advanced 1080p cameras that let you see and speak from the convenience of your own smartphone. One of the greatest things about DIY home security alarm systems is you have complete control of the entire system. You get to determine where you can position the sensors (or cameras) and you get to control the type of alerts you can receive or how to receive them. You can check alerts and monitor your home simply by her phone or tablet. Many DIY home security systems also have the option of sending an alert the police if you see suspicious activity in your home. DIY home security systems also have the great flexibility of being able to be moved from house to house. For those that rent or do not have the intentions on staying in one place for years at a time; you can pack it up and move it along with you. Which is incredibly convenient when you are still going to college and have no idea where you will end up, but still want that peace of mind while you are waiting. When a Professional system is installed it tends to be a bigger pain and hassle; it offers a lot less flexibility with moving the security system. For those who don’t plan on staying in the same home for years it can be a huge hassle; that can be avoided. Normally if you have had it put in professionally you cannot take any of the equipment or the system with you; due to the wiring and going through walls that they have to go through as part of the process. Professional installers usually also have a much higher cost for installation, an activation fee, and a hidden fee for monthly monitoring. 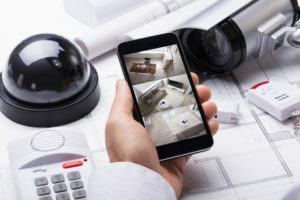 Another plus to a DIY home security system is you can literally put the cameras in the most convenient and most precious areas in your home. Say your kids room; now who would not like that convenience and peace of mind (of knowing at any given time you can conveniently check on them and make sure everything is okay)? If you have a newborn infant; just think it is a tap away from your phone for easy peace of mind. A DIY home security system is typically lower in cost and offers more control over the system set up, it requires a greater investment of energy and time. Having a professional home security installation definitely makes for easier maintenance, and setting up. In my opinion it is an easy choice (save a lot of money or go the easy way and spend way to much). Go with a DIY home security system save some money and look into it today!